The Win The Battle Foundation is a non-profit, 501(c)(3), organization that offers support and resources to children and adolescents who have fought or are fighting cancer or other life-threatening diseases. The Foundation is aimed at those kids who are or were athletes while fighting their "battles". Awnee Montano receives a 2018 "Do What Makes You Happy" Gift! Awnee, 15, was presented with a "Do What Makes You Happy" gift to help her battle a rare form of ALL. An adorable young lady who continues to need our prayers! Jason Horton receives a 2018 "Do What Makes You Happy" Gift! Jason has battled many forms of cancer since he was a child and continues to persevere! 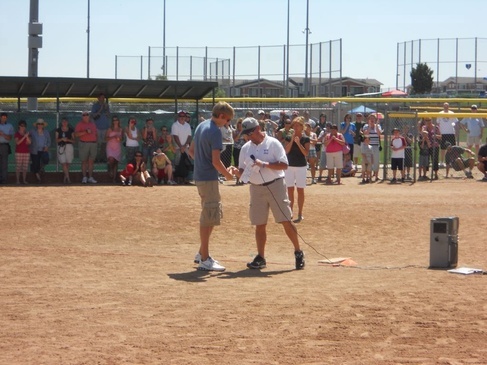 A Special Olympian, Colorado Sports Hall of Famer and an ESPY Award winner. Truly an inspiration. Toby Geselevich receives a 2018 "Do What Makes You Happy" Gift! 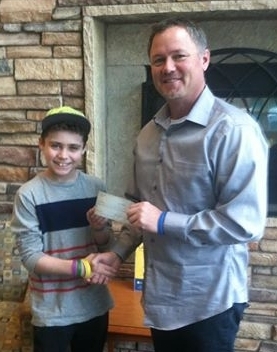 Toby Geselevich is a 10 year-old battling his second recurrence of ALL leukemia. Was a joy seeing him brighten up with the possibilities this gift presents. Julian Arredondo receives a 2018 "Do What Makes You Happy" Gift! Julian is 8 years-old and battling leukemia. Soccer, baseball and cars/trucks are his interests, and playing games! He's an engaging, sweet young man who fights like a champ. Its an honor to be able to help him along the way. Tony Ester receives a 2018 "Do What Makes You Happy" Gift in 2018! 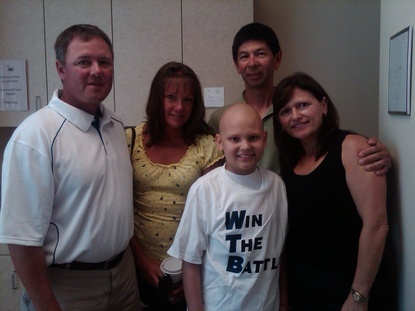 Tony, 12 years-old, is battling osteosarcoma and has an infectious energy about him. Likes to work on cars and scare his mom by not wearing a helmet when riding his bike! Markus, 14, is battling osteosarcoma. He's a big football and music fan and has the energy of a herd of wild horses! Currently in the maintenance phase of treatment and we look forward to the good things ahead with him. Yazmyne, age 14, has one of the most beautiful smiles we've seen! She's currently about 1/3 of the way through treatment for Acute Lymphoblastic Leukemia (ALL). We hope the gift will make her happy and help her continue to expand her singing talent! 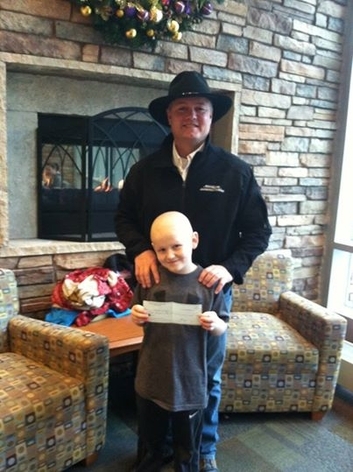 Joel, 9, was presented with a "Do What Makes You Happy" gift to help him in his battle with osteosarcoma. An active and shy young man ready to get back out on the field, dirt, grass, etc.! Cooper Deming received a "Do What Makes You Happy" Gift. 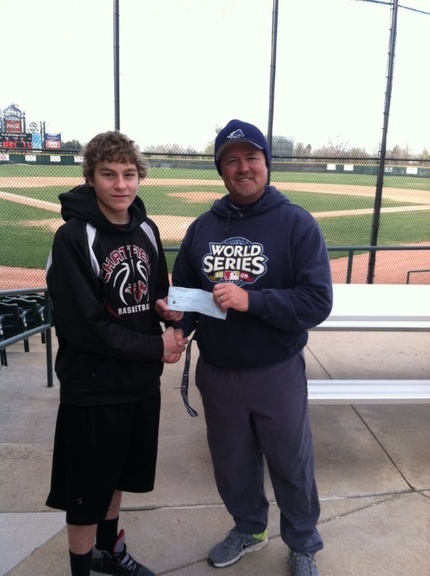 Cooper "Coop" Deming of Wheat Ridge was presented with a "Do What Makes You Happy" gift to help him in his battle. Coop left us way too soon and our prayers go out to his family. His impact in such a short time was truly inspiring. Abbie Hayes receives the 2016 Nate Jurney/Leanna Cagle Scholarship! Abbie, from Ralston Valley High School is attending Ft. Hays State University to continue her education. Congratulations Abbie! 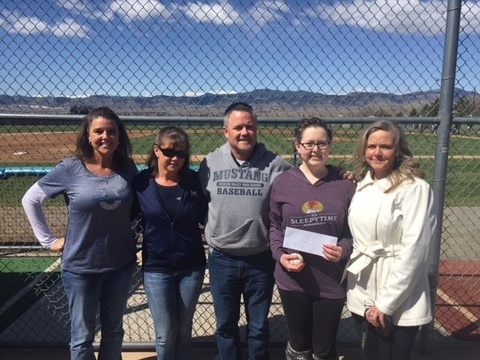 Christian Lyons, from Littleton and Dakota Ridge High School, was presented with a "Do What Makes You Happy" gift of $5000 to help him in his battles against Acute Lymphocytic Leukemia. We are proud to be able to offer this support and pay it forward. Thanks to all of our supporters to make that happen! Robby Blair, from Arvada High School, will be attending the University of Northern Colorado! Congratulations Robby! Jamie, from Arvada West High School, will be attending Colorado Mesa University. Our final "Do What Makes You Happy" recipient for 2015 is Nya Mason. Nya is a 13 year-old battling osteosarcoma and recently completed her 1 year of chemotherapy. She's looking forward to getting back into the pool and resuming her active life! 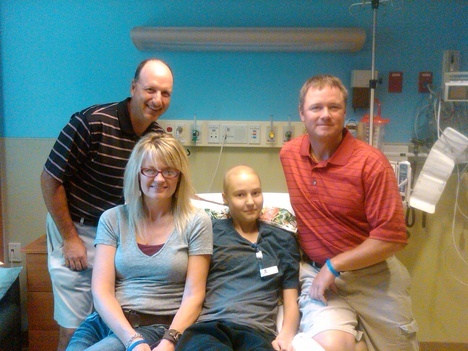 Jacob is 13 years old, and has been battling AML Leukemia since Feb of 2013. 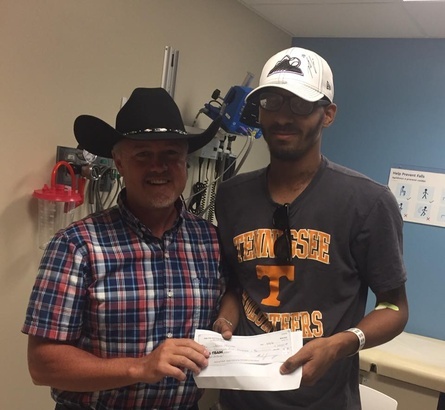 He had a bone marrow transplant during the summer of 2014 and is regaining his strength and hopes to get back on the basketball court and football field again soon! Kaden attends Eaglecrest High School. He was diagnosed with acute lymphoblastic leukemia in July 2013 and is in the maintenance phase of his 3 year treatment plan. Kaden enjoys golf and soccer and hopes to get back on the links soon! Katie Hall receives a 2014 Nate Jurney/Leanna Cagle Scholarship Award! Katie, from Arvada West High School, will be attending Colorado Mesa University pursuing degrees in Business Administration and Health and Exercise Science. Way to go Katie! 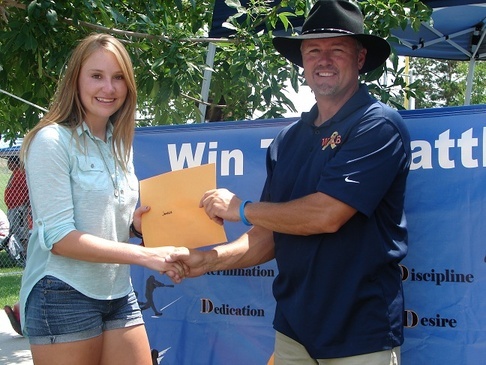 Janelle Feldmann receives a 2014 Nate Jurney/Leanna Cagle Scholarship Award! Janelle, from Ralston Valley High School, will be attending Kansas State University to pursue a Journalism degree (and write about Win The Battle)! Congratulations Janelle! Matthew Murray receives a "Do What Makes You Happy" gift in 2014! Matt Murray is a sophomore at Westminster High School and is an avid baseball player. He's recently completed his chemotherapy and radiation treatments for a rare and fast growing brain tumor. 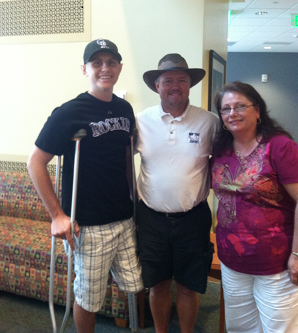 Throughout his treatments, Matthew continued to excel in school work and on the diamond, in spite of double vision. He has fought and won many battles along the way and continues to win battles every day. Derek Valdez, our first 2014 "Do What Makes You Happy" gift recipient! 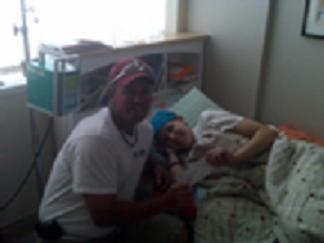 Derek Valdez, from Chatfield High School in Littleton received a "Do What Makes You Happy" gift from Win The Battle! Derek is on his second battle with ALL leukemia since he was 4 years-old, yet still manages to compete in Basketball, and perhaps even Football down the road. 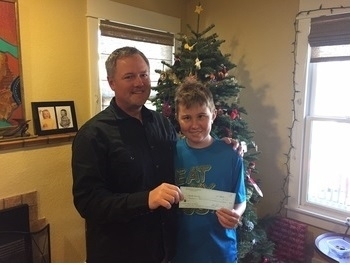 Derek wins battles everyday and we hope our gift can allow him to do what makes him happy. We had the opportunity to meet yet another inspiring, wonderful, beautiful young girl, Erin Pyle, and present her with a "Do What Makes You Happy" gift. Erin, 11 years-old, is battling osteosarcoma and wins battles everyday. We hope our gift can bring a smile to her face for Christmas and we look forward to following her progress! Go Team Erin! 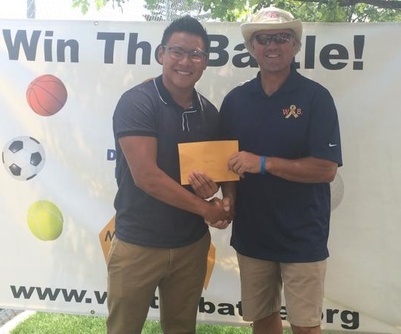 Win The Battle resented Kolton LeClair with a "Do What Makes You Happy" gift! A shy, sweet, strong young man that wins battle's every day! 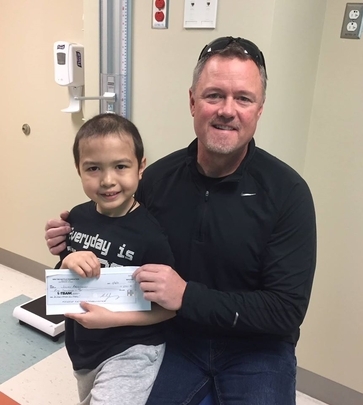 Kolton is 8 years-old and is battling Rhabdomyosarcoma. We look forward to following his progress and recovery so he can get back on his horse! 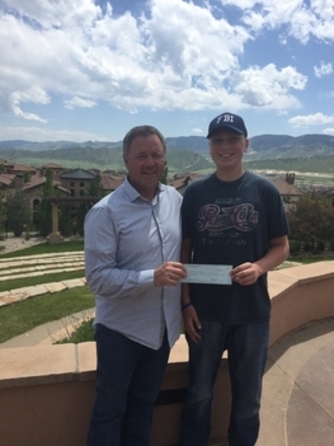 Win The Battle Foundation gave a "Do What Makes You Happy" gift to Logan Piz of Arvada. 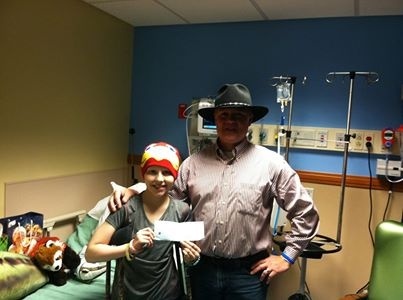 Logan is battling Ewing's sarcoma and is a rising hockey star in the area. He's currently a freshman at Ralston Valley High School. Thanks to all of you who made this possible for Logan! Beth is attending the University of Northern Colorado and will use the $3000 scholarship to pursue a career in Childhood Counseling. 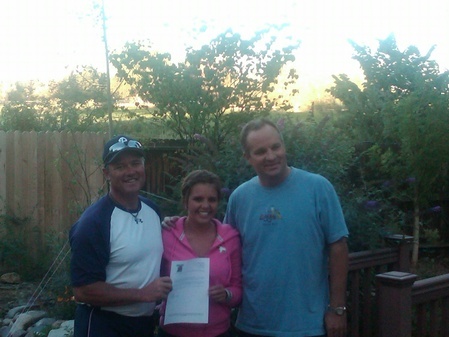 Our final “Do What Makes You Happy” recipient in 2012 was Ian Tuthill. Ian is a freshman at Ralston Valley High School. He was diagnosed with osteosarcoma over the summer. A hockey player and ardent “gamer”, Ian continues to win battle’s every day! Laura is a Senior at D'Evelyn High Schoo, who's active on the soccer team. On March 12, 2012, Laura was diagnosed with Stage 2 Hodgkin's Lymphoma. She has completed her scheduled rounds of chemotherapy and is looking forward to returning to all of her activities. Thank you for helping us help Laura! 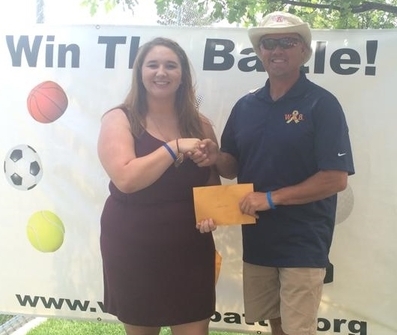 The Win The Battle Foundation presented a "Do What Makes You Happy" gift to Allison Lepper of Laramie, Woming. Allison is a Junior at Laramie High School and is active in Volleyball and Soccer. She exemplifies our "4D" values during her battles with stage IV lymphoma. 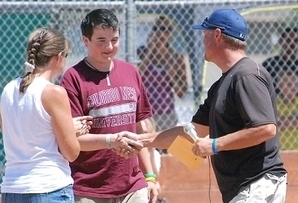 Kevin Mesch, a 2012 graduate of Standley Lake High School was selected as the 2012 Win The Battle Nate Jurney/Leanna Cagle Scholarship. 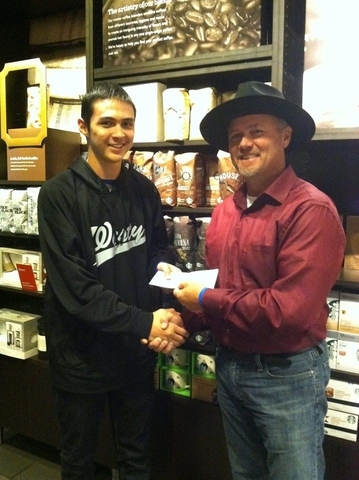 Kevin will use the $3000 to pursue a future in graphic design at Colorado Mesa University. Congratulations Kevin!. 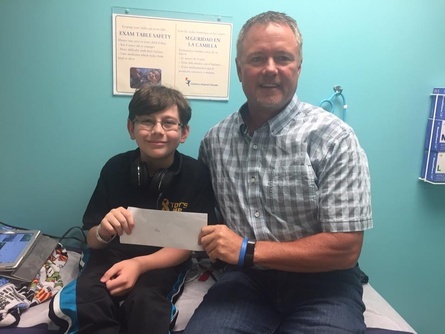 Woody Roseland is a recent recipient of a Win The Battle Foundation Grant to help him fight his battle with osteosarcoma. In 2007, Woody was diagnosed with bone cancer in his left knee. After enduring chemotherapy his left knee was replaced and ultimately amputated. Woody was active in football and can be seen regularly at the Rockies games, in between stand-up comedy routines wherever he goes. He's tackling his latest rounds of chemo with determination and a smile on his face. You can follow Woody's progress on Facebook. Thank you all for helping us help Woody and his family during his battle. If you would like to help Woody and other young athletes fight their battle, please Contact Us. 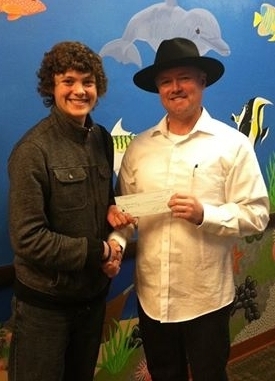 Joel Nelson of Arvada and 2011 Ralston Valley High School graduate is the 2011 recipient of the $3000 Nate Jurney/Leanna Cagle Scholarship. Joel will be attending the University of Nebraska in Lincoln to pursue a degree in Architectural Design. Congratulations Joel! Brooke Marcus of Douglas, Wyoming was recently chosen as a recipient of Win The Battle funds to help her and her family fight their battle. Brooke is a freshman at Douglas High School and is active in multiple athletics, including Velleyball and Softball. She's currently battling ALL leukemia and has the hope and determination to "Win The Battle!". Thank you for helping us help Brooke and her family during their battle. You can follow her progress via the Links page. If you would like to help Brooke, or other young athletes battling cancer, please Contact Us. 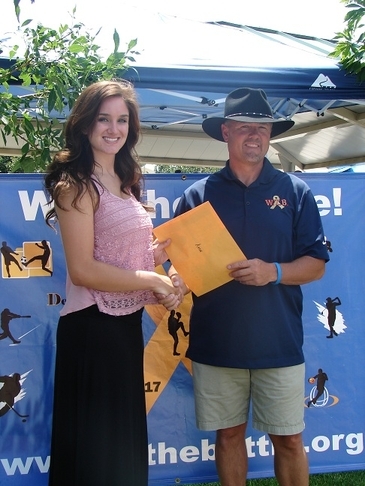 Ally Ford of Arvada is the 2010 recipient of the WTB Nate Jurney/Leanna Cagle Scholarship. Ally is a 2010 graduate of Ralston Valley High School and will be attending Regis University studying to be an Oncology Nurse. Congratulations Ally! 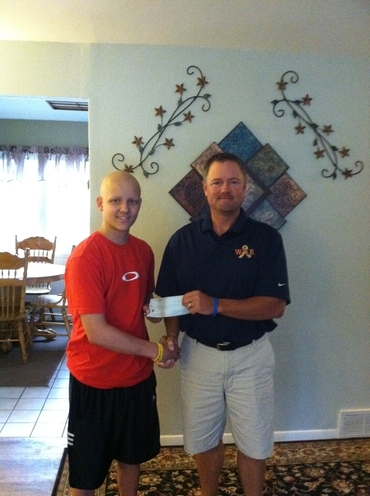 Casey Naudin was recently chosen as a recipient of Win The Battle funds to help him and his family fight their battle. Casey is a 12 year-old boy from Superior, CO who is very active in Lacrosse and swimming. He's currently battling Pre-B ALL, a form of leukemia, but lights up a room with his smile. Casey is determined to "Win The Battle!". Thank you for helping us help Casey and his family during their battle. You can follow Casey's progress via the Links page. If you would like to help Casey, or other young athletes battling cancer, please Contact Us. Emily Hepker was our next recipient of Win The Battle proceeds. Emily is from Jonesville, Michigan. 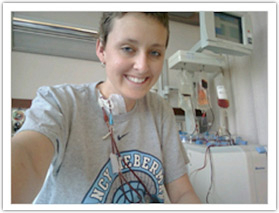 Currently 21, Emily has battled lymphoma and now leukemia since her senior year in High School. Emily loves basketball as both a player and a coach. Thank you for helping Emily Win Her Battle! If you would like to help Emily more, please Contact Us. You can read more about Emily on the Links page. The first beneficiary of the "Win The Battle" Foundation is Makensie "Kensie" Owens. Kensie will be a sophomore at Sierra High School in Colorado Springs and is active on the basketball, volleyball and soccer teams there. She is currenly battling Ewings Sarcoma and is determined to "Win The Battle"! 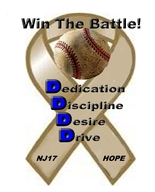 Thank you to all who support the "Win The Battle!" cause and for helping Kensie fight her fight! You can go to the "Links" page to follow Kensie's progress via Care Pages.